On the Occasion of the Annual Festival, UDYANOSTSAV, held in the months of February and March at the Mughal Gardens, New Delhi . 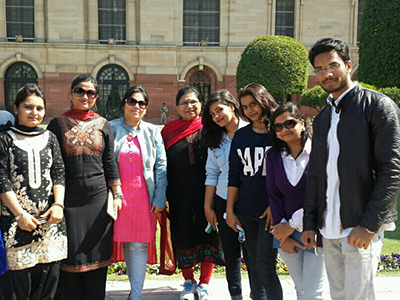 Students of Faculty of Nursing & Faculty of SGT University, Gurgaon went for an excursion on 25th February 2017, along with Faculty members Prof. Ms Soma Kumari, Professor, Ms Shweta Sharma Assistant Professor, Ms Anu Grover Assistant Professor with B.Sc. Nursing 3rd year (69) and M.Sc. Nursing (07) students. We visited the Rose garden in which apart from the Roses, Tulips, Asiatic Lilies Daffodils, Hycanith And Other Seasonal flowers beautifies the gardens of Rashtarpati Bhawan. There are more than 70 varieties of seasonal flowers including exotic bulbous and winter flowering plants.. The gardens has almost 50 varieties of trees, shrubs and vines including Moulsiri trees, Golden rain tree, flower bearing Torch tree and many more. The students had great fun & it was an awesome experience for them.